The entryway to this brick building is huge and constructed of gray stone. 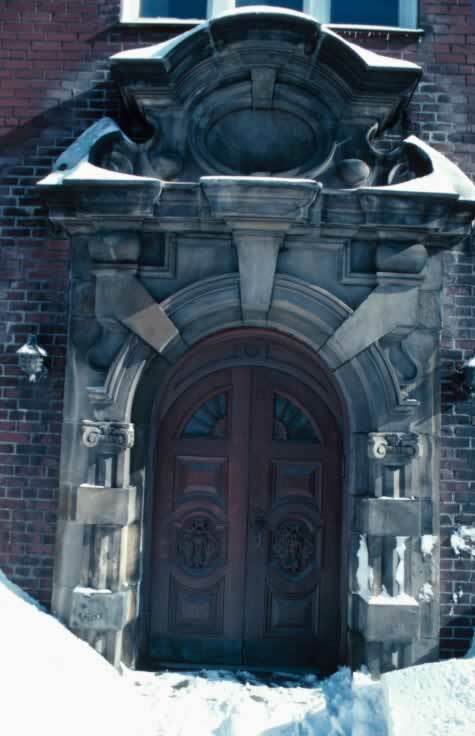 The entry way itself is a true arch with symmetrical detailing, including a protruding keystone. Above the arch is a large carved stone oval, topped by an overhanging roof of sorts--all part of the symmetrical design of the entryway. The double exterior doors are made of wood and are a four panel design. Together, the doors form a true, or rounded, arch. The top panel of each door is a collection of lites--windows in doors--that form a wedge. The second panel is a raised panel. The third panel, which looks to be in the middle of the door, if the lites are discounted, is an intricate carving. The door has no true mid rail. The fourth and lowest panel on the door is also raised.